The intestine of parasitic nematodes has proven an important target for therapies aimed at prevention and treatment of diseases caused by these pathogens in humans, animals and plants. We have developed a unique research model with the intestine of Ascaris suum, the large round worm of swine and humans, that will enhance biological research on this tissue. To expand utility of this model, we quantitatively compared expression of 15,382 coding RNAs and 277 noncoding, micro RNAs (miRNAs) among 3 contiguous regions of the adult A. suum intestine. Differentially expressed transcripts were identified among regions, with the largest number expressed at significantly higher levels in the anterior region, identifying this region as the most functionally unique compared to middle and posterior regions. We further identified 64 exon splice variants (from 47 genes) that are differentially expressed among these regions. A total of 2,063 intestinal mRNA transcripts were predicted to be targeted by intestinal miRNA, and negative correlation coefficients for miRNA:mRNA abundances predicted 22 likely influential miRNAs and 503 likely associated miRNA:mRNA pairs. A. suum mintestinal miRNAs were identified that are conserved with intestinal miRNAs from C. elegans (10 mature sequences and 13 seed sequences conserved), and prospective intestinal miRNAs from the murine gastrointestinal nematode, Heligmosomoides polygyrus (5 mature and 11 seeds). Most of the conserved intestinal miRNAs were also high abundance miRNAs. The data provide the most comprehensive compilation of constitutively and differentially expressed genes along the length of the intestine for any nematode species. The information will guide prospective development of many hypotheses on nematode intestinal functions encoded by mRNAs, miRNAs and interactions between these RNA populations. Bruce A. Rosa, Samantha N. McNulty, Makedonka Mitreva, Douglas P. Jasmer. (2017) Direct experimental manipulation of intestinal cells in Ascaris suum , with minor influences on the global transcriptome. International Journal for Parasitology 47:5, pages 271-279. Intestinal miRNAs in A.suum and their predicted mRNA targets. 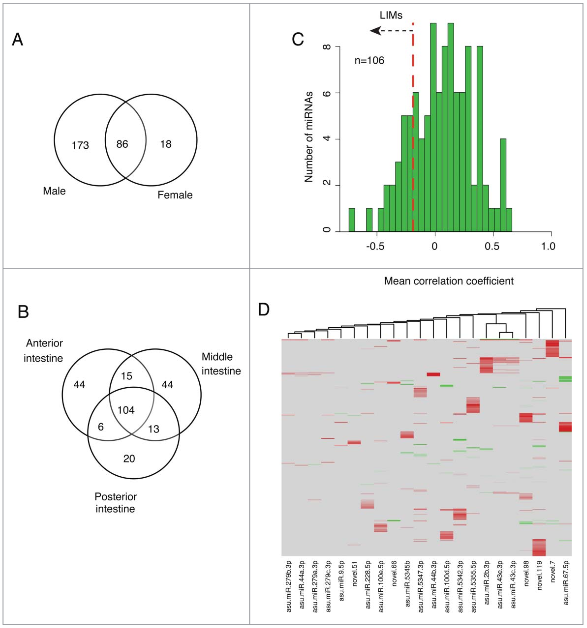 (A) Distribution of miRNAs between genders; (B) miRNAs detected in each intestinal region in male worms. (C) Correlation between miRNA abundance and expression levels of predicted mRNA targets. Mean expression levels of all the predicted targets of each miRNA were calculated. The figure shows a histogram for all miRNAs that were detected in at least 4 different samples (106 miRNAs), resulting in robust correlation coefficients with the target genes. The red line indicates the threshold for the lowest quintile which was used to identify LIMs. (D) LIMs-target mRNA abundance correlations. Clustering of both groups was done based on correlation coefficients. Table: abundance_Sup_table.tsv - miRNA abundance table.